Spain is also famous for its Tapas, small plates of snacks that make a great way of eating, The variety is huge, some bars list their tapas on menu boards but you will find most have a long glass fronted fridge that sits on top of the bar that you can choose from, favourites are prawns in garlic oil (gambas al ajo), meatballs (albondigas), tortilla, a rich omelette made with potato and onion or vegetables. 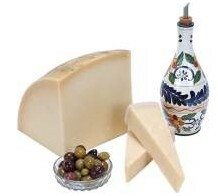 There are hundreds of kinds of tapas to choose from and will vary from region to region. The best way to eat tapas is with a glass of cool larger, a rich rioja wine or a fine glass of Jerez sherry, in the summer month’s jugs of fruity sangria are often a favourite. It’s not normal to make a meal out of tapas but with a large selection, plenty of bread it could easily replace a meal. A larger portion of tapa is is called a racion. The Spanish as a nation love to drink wine with their meals but rarely drink to excess, the Spanish don’t need to drink alcohol to unwind and have fun it seems to come naturally. Wine is drunk slowly and often with water and brandy is enjoyed after a meal. Something that must be tried, Horchata a famous Spanish soft drink served in the summer made with tiger nuts makes a refreshing milky drink. During the daytime the bars and restaurants filled with folk enjoying the “menu del dia” (menu of the day). The Menu is often 3 or 4 courses with the first course being a salad or small plate of local hams, gazpacho or mussels, followed by a smaller course of a rice or pasta dish, the third course being the main plate of grilled fish or meat with vegetables and if you can still manage more “postre” the pudding of the day which is more often than not home made on the premises, and finished off with coffee. The price will often include a drink as well. This is one of the most economic ways to enjoy sampling the local Spanish dishes, the prices vary from town to town and bar to bar for a “menu del dia” varying from €7 to €10 euros per person. Apart from the wealth of traditional Spanish restaurants and tapas bars along the Costa Blanca, International cuisine has also become very popular in Spain, its not hard to find good Italian, Indian or Chinese restaurants . I have selected a small selection of traditional Spanish recipes for you to try, check regularly for updates, if you have any recipes tried and tested please forward them to us. 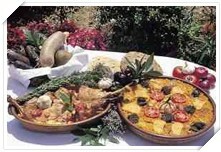 Spanish Recipes - Try out some traditional Spanish dishes. lightly fry the meat, sausages and garlic in an earthenware casserole. The add one tomato and stir the rice around the casserole a few times. Lightly fry the other tomato. Add a double measure of water, season and add the precooked chickpeas. Slice the potato, lightly fry them and place them together with the tomato on top of the rice. Bake in the oven until golden brown on top. Heat the oil in a 9-inch Pan ,add potato pieces, add onions. COOK slowly, medium flame. DO NOT FRY!! Turn occasionally until potatoes are tender, but NOT brown. Beat eggs in a large bowl with a fork. Salt to taste. Drain potatoes and onion and add to beaten eggs, pressing them so that eggs cover them completely. Let sit for 15 minutes. Heat 2 tbsps of the oil in non stick pan. Add egg mixture, spreading quickly. Lower the heat to medium-high. Shake pan to prevent sticking (crucial step!!) When potatoes start to brown, put a plate on top of the pan and flip to cook other side, Brown on the other side. Can flip three or four times for better cooking. This is a fresh, chilled soup, to be served in summer, and it is surprisingly good. Strictly speaking the tomatoes (which should be good red plum tomatoes) should be scalded, peeled and sieved to a purée, but you can cheat and use pasata. The green pepper should be cored, de-seeded and chopped finely, and the cucumber grated. Smash and chop the garlic finely and then mix all the ingredients with the oil and vinegar or lemon. Add a little salt. Chill for an hour or two and serve with croutons. Combine the wine, bitter lemon, and sliced orange and lemon in a large pitcher. Add sugar. Chill. To serve, pour over ice cubes in glasses and garnish with mint.